It can happen to anyone — just that one time you forget to protect your home’s plumbing system from freezing, and wake up to flooding in your home. Keep water moving: Water that’s moving will freeze at a lower temperature than water that’s still. Even minimal movement of water through your pipes can prevent them from freezing, so leave one faucet dripping a bit during a hard freeze. Plumbers recommend turning on the faucet that’s farthest from the main water feed into your home. Don’t turn off the heat: If you plan to be away from home for a few days while there’s a chance of sub-freezing temperatures, set your thermostat to no lower than 65 degrees. Turn off outdoor faucets: Disconnect garden hoses and make sure that no water is left inside the faucets or in any exposed part of the pipes running to it. You can also place covers on outdoor faucets. Open cabinet doors: Allow warmer air to circulate around the pipes under your sinks by leaving cabinet doors open. This is especially important if pipes are located near an exterior wall. Add insulation: Insulation is a simple and relatively inexpensive way to protect your pipes. Foam tubes for this purpose are readily available in hardware and home-improvement stores. Use insulation on pipes that are near exterior walls or windows or in unheated garages and basements, which are the most vulnerable to freezing. Locate the shut-off valve: You don’t want to be frantically searching for your shut-off valve if you do have an emergency. Make sure you know where it is and that it’s fully operational before potential problems arise. Keep your plumbing system in good condition: A leak may be your first clue that a pipe is susceptible to bursting. Have a professional plumber inspect your plumbing and repair any problems right away. What if a pipe has already frozen? 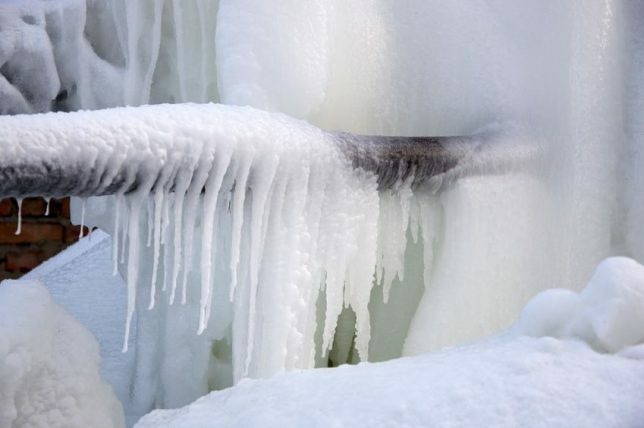 If a freeze does catch you by surprise or you believe you have a frozen pipe, shut off the water to your house first. If you can easily access the pipe, a blow dryer (not a blow torch) aimed at the frozen spot is one way to thaw it safely, but only if you don’t have to stand in water to do so. If a pipe has burst and you have flooding, move any items in your home to a higher level, but don’t risk harming yourself by wading too long in freezing water. Call on a qualified professional. The best way to ensure that your plumbing system is properly protected from freezing is to contact a professional plumbing contractor. At Contractor Connection, we’ve already verified that each of the plumbing contractors in our network have the experience, licensing and insurance to take care of all of your plumbing needs. If you’d like to get in touch with a contractor near you, please enter your ZIP code above.